Discontinued video editing package; update via Software Update. Is there a better alternative to Apple Final Cut Express? Is Apple Final Cut Express really the best app in Video category? Will Apple Final Cut Express work good on macOS 10.13.4? Final Cut Express has been discontinued. If you have version 4 and need to update, you can do so via Apple Software Update. Apple Final Cut Express... Create professional-quality video with Final Cut Express. Apple's feature-rich DV editing software is designed for the complete beginner, aspiring filmmaker, educator and experienced DV editor alike. 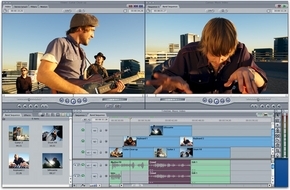 The new version features RT Extreme for real-time compositing and effects, an enhanced user interface, real-time color correction tools and enhanced audio editing capabilities. Aaddresses a number of other minor issues. Apple Final Cut Express needs a rating. Be the first to rate this app and get the discussion started!